It seems that even the smallest towns have some sort of dollar store, and I can understand the appeal. If everything in the store is a dollar, then you feel free to splurge and go crazy with your shopping. After all, everything in your cart is just a dollar, right? 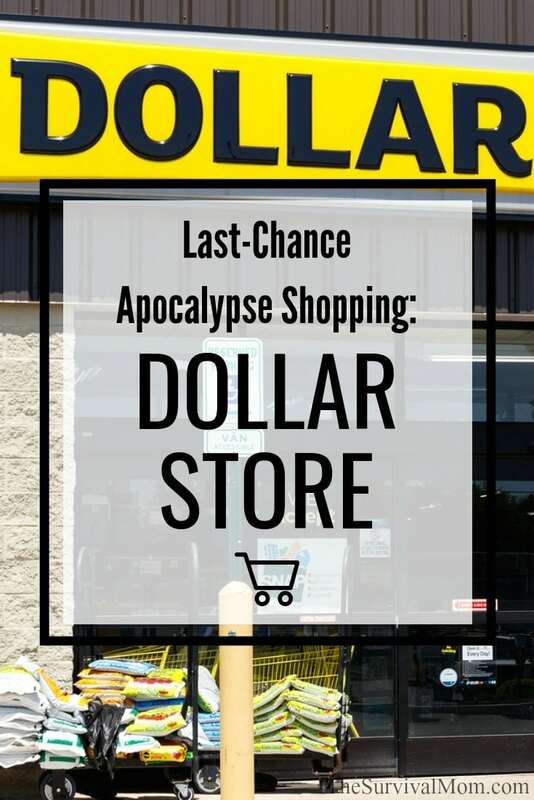 If there is ever a store that will be close by when the sudden need for apocalyptic shopping, it will be a dollar store. Whether it is a chain or mom and pop store, they are dotted all over most cities. These inexpensive little stores offer preparedness gems, not just for those on a budget, but for everyone. In the case of a true worst case scenario and a dollar store is nearby, you could do a whole lot worse than rushing in to grab some last-minute preps. Check out the top 10 survival/prepper items one can find in most dollar stores. Go ahead and load your cart with these two must-haves. They are both items you should have in all of your cars, 72-hour kits and in your junk drawer at home. It never hurts to pick up extra when you are there, pre-apocalypse. Superglue can be used on ceramic, rubber, vinyl, plastic and in repairing cordage as well as a sanitary way to close minor wounds, and you just can’t go wrong with duct tape. 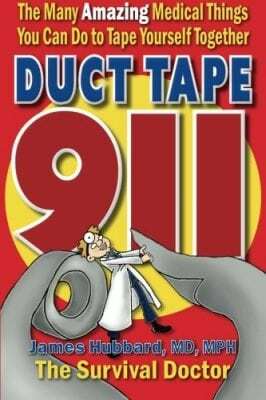 I highly recommend the book, Duct Tape 911, by Dr. James Hubbard, the Survival Doctor. It’s a collection of very creative ways to handle medical emergencies with duct tape. I promise you there will be first aid and medical solutions you’ve never thought of in this book. You’ll be glad you stocked up on duct tape. With many types and materials to choose from, you can’t go wrong with loading up on all kinds of rope and bungee cords. Both are wind and waterproof, and certainly, a must have for preppers. Bungees can be used to make an emergency shelter, replace a broken belt or rope, use to hang items. Rope and bungees both can be used to bundle debris, tie down tarps, secure loose items and hold doors shut. There are so many uses for these that, again, you can’t go wrong with stocking up on plenty of both. Have you ever considered gloves as prepping essential? Well, you should. Gardening, vinyl, nitrile, dishwashing gloves, winter gloves — every one of them is worth having on hand. In the Dollar Store, you’ll find gloves on different aisles — the gardening supplies aisle, the hardware aisle, the first aid aisle. You’ll find gloves for almost any purpose you can imagine. You may not find super heavy duty gloves here but read this to learn where to get heavy duty gloves for adults and kids. When it comes to your feet, you cannot be too careful. If you aren’t able to run or walk, you could be left behind to survive on your own. This article explains how to care for your feet and basic items you should stock up on for their care. Like gloves, you can find a little bit of everything at The Dollar Store, and socks are more versatile then you might think. What can you do with socks? They can be used as an extra layer of warmth over little babies’ arms and legs. Socks can be cut and used to wrap or hold bandages, make a rice heating pad — your imagination will come up with multiple uses. Keeping clean and cutting down on germs is a top priority in a disaster. When water isn’t available, it is helpful to have wipes. Since they are one-use only, you’ll quickly go through one package after another. During your post-apocalypse shopping spree, go ahead and fill your cart. Those wipes won’t go to waste. Most of us have thought to stock up on toilet paper, but Kleenex. or facial tissue is another versatile supply you can’t have enough of. Read up about how toilet paper isn’t food. It will give you food for thought about non-food items that you should store. Studies have found that the sunblock in the dollar stores is the same quality as name brand versions. With the tubes only being a dollar, you can stash these in all of your bags and cars. In a post-apocalyptic world, who knows how much time you’ll be spending outdoors, and if you’ve ever experienced an extreme sunburn, you know how painful they are. Sunblock is something a lot of preppers and survivalists might not consider as essential, but at this price, you really should buy plenty. If you do end up with a sunburn, aloe is a soothing gel for sunburn relief, and it can help with rashes and itchy skin. When sunburn does happens it’s nice to know that there is information to learn about soothing herbal sunburn remedies available to help our bodies recover. The information in this article will give you ideas of additional products to have on hand. Bags of all kinds can help keep your organized when everything is chaotic. Now isn’t the time to worry about appearances. Trash, food storage, tote or shopping bags — wander the rows of merchandise and you will find bags galore. The quality is sometimes amazing! Other times, not so much. So check out the construction of the bag before you by and consider it’s purpose. Bags can make personal hygiene easier to dispose of, made into a temporary tarp or help with debris clean up. They can become laundry baskets, filled with firewood or edible plants, or used to carry water. There are multiple uses for every kind of bag you can buy. Now is the time to really stock up. Disposable diapers will be found at The Dollar Store, and they are perfect for absorbing liquid, like vomit or big spills. Disposable diapers are also great for protecting wounds, but not for actually stopping the bleeding. Keep one in the freezer to use as an ice pack or pour hot water inside for a heat pack. The shape of the diaper curves around body parts perfectly. If you are a cloth diaper kind of parent, you can learn about the down and dirty with cloth diapers here! Depending on the dollar store in your area, you might find cloth diapers there. Any of these coverings will provide an instant clean surface when you need a ground cover. They can provide shelter, be used as a makeshift stretcher, protect items from wet weather, cover a broken window or cover a leaking roof. A makeshift bedroll, bag or a protective wall for a latrine can be made from a tarp or tablecloth. Plus, they store flat and you’ll be able to stack many of them on top of each other. Use any of these items as a wind, smoke or dust mask. Tie a wet bandana around your neck to keep cool, and tuck one under the back of a hat to keep the sun off of your neck. Umbrellas can be used for protection from the sun, a walking stick or for self-protection. Here is a list of uses for bandanas. What other ways could you put a hat or umbrella to use? 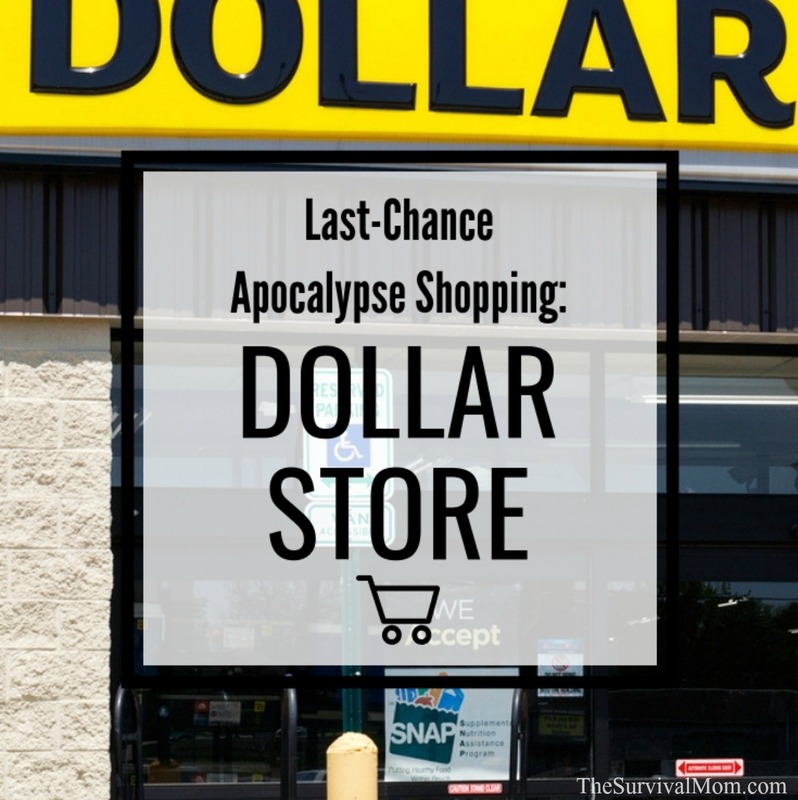 So, if the apocalypse happens, a quick run to a dollar store may be a lifesaver. With people grabbing common emergency items, there may be odd items left, things many will overlook. Now is the time to look at these items with different eyes. Survival Survey: How do you prepare for a Greatest Depression? My local dollar stores have a lot of food, kitchen items, bedding, candles, seed and planting supplies (in season), water, OTC meds, toiletries, cleaning supplies, lamps and lamp oil (sometimes), flashlights and batteries, clothes and underwear, grills and supplies (grill tools, charcoal, lighter fluid), lighters and matches, hand tools, and many other things. My local Dollar Tree even has freeze dried fruit. It’s good and much cheaper than at other stores. Never discount a discount store! Lisa, I LOVE you take the time to investigate so many ideas for readers like me. Really like the Dollar Store ideas. It’s one of my favorite stores anyway. I want to be ready for whatever is coming my way and this information is invaluable. Thanks! One caution: Duct tape can be good or bad depending on the brand. Before you buy multiple rolls, try one to test. Some of it is junk. That’s a really good tip. Thanks. I love my dollar general store !! Overton,TX. 75684 clean and polite ! And every time I ask about a product !! There’s a big your welcome to go !! It’s not easy folks ! People don’t realize how much product comes on a truck and leaves in are vehicles !! I am thankful for my dollar general store !! Sincerely !! Mr. Terry Mouw !! I wouldn’t rely on dollar store rope or bungees. The rope will snap hanging up a tarp I guarantee you. I wouldn’t want to test the bungees with anyone within snapping range. If they are good brands that’s one thing but if they’re made for the dollar store chances are they are cheaply made – otherwise I agree with there being useful stuff to get there. You can usually tell on the label where it’s made and that will tell you the quality. Be on the lookout…our Dollar Tree carries shelf stable milk, and if I recall, it is organic rated or close… they carry a lot of junk (the duct tape stinks) but you can’t beat them for first aid supplies. One thing everyone forgets… soap! Dish soap, body soap and bleach. Most people will die from water borne diseases in a long term conflict. Don’t underestimate the need for bacterial and viral control.